Happy Memorial Day! Just a quick patriotic post for you today. Don't you love red, white, and blue? I love the timeless, classic look of this trio. Hi, Amber! Thanks so much for visiting and for your sweet comment! Hope you're enjoying your Memorial Day! Come back anytime! Love these! I really like that you didn't use patriotic paper - just stuck to the color scheme. (Hopping over from Give me the Goods). I'm so glad you like them. I love using the colors schemes, and not so much the themes. Thanks so much for your comment, Sarah! Come and visit again soon! Hello again, Tara! So nice to see a familiar face. So glad you like them. Enjoy your day! Very pretty. Great idea for a party. I'll have to remember this for my 4th of July get together. Thanks. Thanks so much, Sarah! They are perfect for parties. I sure appreciate your comment. Come back anytime! These are so pretty! 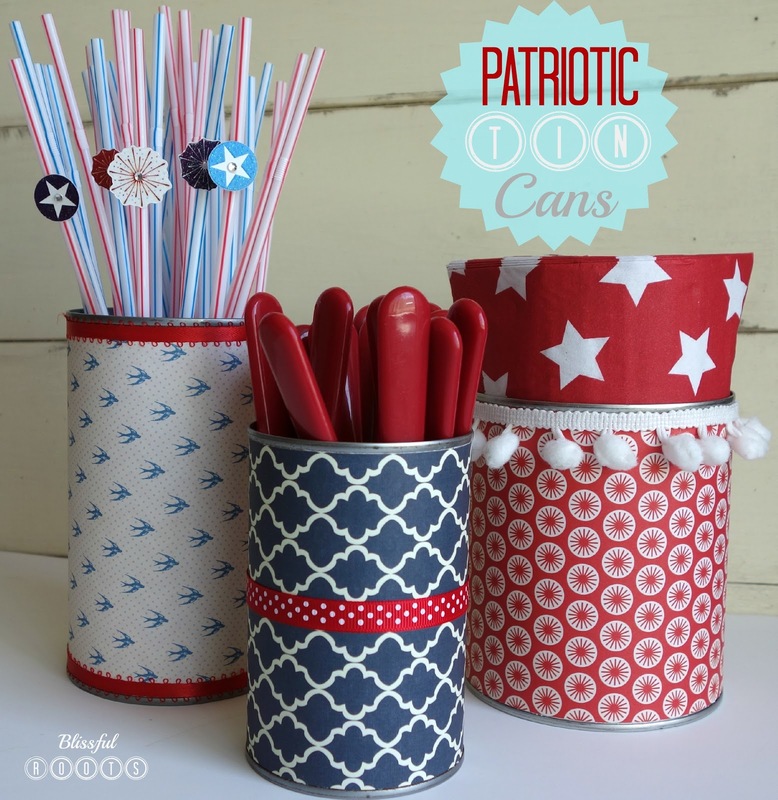 I love to re use those tomato cans too- perfect idea! Cute, great way to recycle! These look pretty easy and perfect for my brother's welcome home party! These are so cute! I love the pom pom's, too. The pom poms are my favorites! Thanks so much for always hosting such a great party! Have a wonderful day! These turned out really cute!! Feel free to come by and link them up at ShareAtopia! Oh my goodness Brooke, your caddy is so cute. I totally understand the cheesiness of themes. I used to be a big theme person, but lately I love basic colors. Thanks so much for stopping and commenting. I sure appreciate it. Have a wonderful day!